Stirchley Happenings is one of the co-founders of Stirchley Community Market, working alongside Loaf, South Birmingham Food Cooperative and Birmingham Town Centre Partnerships. 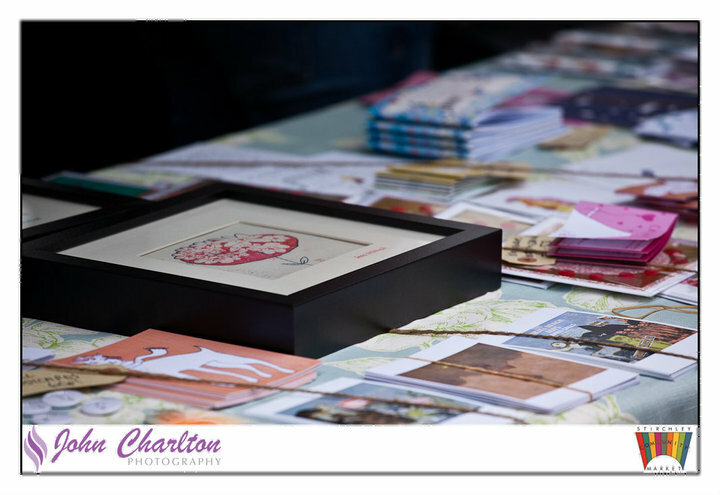 As well as our involvement in the coordination of the market, we curate the arts and crafts stalls, which sell a range of work from illustrators, artists and makers who have a connection with the area. So if you are looking for a unique gift for a friend or relative, or would like to treat yourself, then the market will have something for you! Tickets for our film nights (see The Travelling Bughouse tab above) are also available from the market; just ask at our stall and we’ll book you a front-row seat! We’d also love to hear your suggestions for films you would like to see. One of our main aims as a community organisation is to generate and support cultural activity in the area. We want to improve the local built environment; increase awareness, pride and participation in Stirchley and its history, and support suitable opportunities for investment. We hope that establishing a community market will encourage residents to celebrate the area, as well as showing visitors what we have to offer – putting Stirchley on the cultural and business map. Our craft stall showcases emerging creative talent, providing the opportunity for these local artists to sell their work and raise their profile. We are excited about the potential there is in the area, and how Stirchley can regain some of its former glory by valuing the history of its built environment, and the contributions of its community.